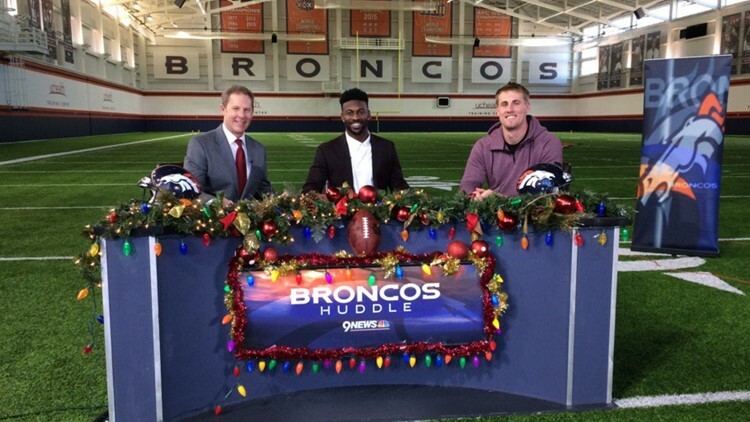 Special guest Jeff Heuerman joined Emmanuel Sanders and Rod Mackey on the Broncos Huddle on Wednesday, December 20. Broncos mailbag: Emmanuel's side gig, reviewing head coach interviews, wondering if Keenum starts and ladies, what's up! KUSA – Sitting around watching another Friday snowstorm and catching up on about three weeks of mail from Broncos followers. I saw E on the NFL Network last weekend, and felt he was thoughtful, insightful and honest in his appraisal of the AB situation. He was completely professional. If AB takes issue with anything Emmanuel had to say, he’s only hurting himself, at least in our eyes. Dennis – You know where Emmanuel Sanders cut his teeth on those TV panel shows don’t you? On the Broncos Huddle, which is shown Wednesday on 9NEWS during the season. He was the permanent player host with anchor Rod Mackey for four years from 2014-17. Broncos Huddle viewers were hardly surprised by Sanders’ impressive performance on the NFL Network last weekend. The league and ESPN should pay 9NEWS a finder’s fee. Our station broke in Adam Schefter back in the day, too. Look at him now. I heard what Sanders said about his former teammate Antonio Brown and he did speak the truth when he said Antonio brought it on himself by skipping practices in the final week of the regular season then announcing on game day he was ready to go. The problem is, the truth hurts. The essence of why relationships between the media and people they cover – whether in government, education, business or sports – will always be touchy is because the media has an obligation to the truth. Sanders told it like it is, then learned his former teammate didn’t like him for it. And so it goes. I've always appreciated your reporting and read your twitter every day for the latest. You think there is hope the Broncos will get better on the O-Line. [In my opinion] they have been terrible at O-line during the entire Elway GM period. There have been occasional bright spots, (Garett Bolles started off good, but can't go more than two series without a penalty or bad play) but if there is no real improvement, they better hope they can find a QB that can get rid of the ball in 2 seconds. Any idea who they will get to coach since they are losing Sean Kugler? Seems like if he was such a respected coach and couldn't get them to play any better, they need better talent. Doug – In the days since you sent this letter, you have learned the Broncos have hired Mike Munchak to be their new offensive line coach. That’s huge news as Munchak is considered one of the best blocking coaches in the league. The bad news is he didn’t bring his three Pro Bowl offensive linemen with him – left tackle Alejandro Villanueva, guard David DeCastro and center Maurkice Pouncey. I thought the offensive line played well last year. Both offensive line units – the one that played before the injuries and the revised line used after the injuries – performed well in the running game. And the pass protection held up until the final month when opposing defenses showed little respect for inexperienced receivers on the outside and loaded up the box and brought heavy pressure. More good news is it also looks like the Broncos will be bringing back Chris Kuper as Munchak’s assistant line coach. Kuper will interview early next week and there’s a good chance he’ll get the gig. Kuper is a former Broncos starting guard who spent the past three years working as an assistant coach for Adam Gase’s Dolphins. Now that Munchak and perhaps Kuper will handle the instruction, the biggest decision the Broncos will have to make is with their free-agent center Matt Paradis. They would like him back, but he will test the market. I've asked this question of several people, but no one seems to know. Do you know what Case Keenum says before he gets the snap? To me, it sounds like, "Ladies, What's Up?" I'm sure that's not it, but do you know what he actually says? Sorry, it's a small thing, but it's driving me crazy! But, I do like, “Ladies, What’s Up?” much better. Which reminds me, Omaha is no place to be this weekend. It’s 6 degrees there at the time of this writing. Gary Kubiak as OC again? NO WAY! He was more plain vanilla than this year’s OC (Bill Musgrave). By the second game, every team in the NFL knew his plays. Bring in Zac Taylor as offensive coordinator. Let's see how serious Elway is in turning over a new football leaf! Find another place for Kube. Ron – This letter was delivered on Jan. 3 – the day the John Elway-led head coach search committee held its interview with its first candidate, Chuck Pagano. And a week before the Kubiak and Broncos break up. I publish this letter to let everyone know how Ron was dead-on with his thoughts. At least the Broncos think so. When Kubiak insisted two of his most trusted assistants, Rick Dennison and Brian Pariani, be part of his coaching staff, Elway balked. Elway wanted to go all-in with his offensive line coach and hire Munchak, and Pariani was fired two years ago and the organization wasn’t ready to reconcile. It was a deal-breaker and now Kubiak and his posse -- his son Klint Kubiak, Pariani, and likely Dennison -- will run his West Coast offense for Kirk Cousins and the Minnesota Vikings. The Broncos didn’t get Zac Taylor as offensive coordinator but someone like him in Rich Scangarello. Taylor is the Rams’ quarterbacks coach under Sean McVay, who mentored under Mike and Kyle Shanahan in Washington. Scangarello was the 49ers’ quarterbacks coach under Kyle Shanahan. Taylor, by the way, will become the Bengals’ head coach as soon as the Rams’ season is finished – either Monday morning or February 4, the day after Super Bowl LIII. I don’t know if your thinking was correct, Ron, but you were thinking along with Elway. Broncos fans can only hope you are right. Hi Mike. Loved reading your bio. I can relate to a lot of it. I am a 30-year high school coach (football, basketball, baseball). We watch you every night. Anyway, my question is, what do you know about the interview process? I hear it can go several hours. Would like to have some insight as to how it is conducted. Thanks for your time. P.S. I am 74 and still in a school full time commuting to Shiprock, N.M. which is 100 miles round trip. Keep up the good work. Don – Dang. I admire your profession and your zest for it. The interview process was a little different at Broncos headquarters, where Chuck Pagano and Munchak held theirs, then at a hotel conference room, where Elway and his search committee met with Taylor near Van Noyes, Calif.; Brian Flores in Providence, R.I.; and Vic Fangio in Lake Forest, Ill. The search committee consisted of Elway, his top football personnel deputy Matt Russell, administrative director Mark Thewes and public relations boss Patrick Smyth. People might wonder why Thewes and Smyth were part of the committee. As big as the head coaching job is, it made sense to include those who deal with the internal football operations (Thewes) and external elements (Smyth). Thewes and Smyth are also trusted advisors whose opinions Elway values. The committee represented Elway’s inner circle, simple as that. All four met with a candidate for about two hours before taking a break, and reconvening for another hour or so. Questions came up as the interview went along. Questions were asked about philosophy in dealing with players, discipline, previous influences, staffing, analytics and dealing with the spotlight and scrutiny of Broncomania. The idea is to get a feel for the candidate’s personality and how he would fit inside Broncos’ headquarters. From what I understand, Elway runs the show. He’s the general manager. He’s making the hire. Elway also met privately with each candidate, whether it was informally in a hotel hallway with Taylor and Flores – whose time was tight because they were squeezing interviews with several clubs while also preparing their own teams for the playoffs – or over dinner with Pagano, Munchak and Fangio. After each interview, Elway talked with his search committee. They reviewed the interview, discussed each candidate's pros and cons. After his final interview on Monday, Jan. 7 with Fangio, Elway began deliberating between Fangio, the Bears’ defensive coordinator, and Munchak, the Steelers’ offensive line coach. Both were extremely experienced and yes, a little older than most NFL coaches – Fangio is 60, Munchak is about to turn 59. Elway will turn 59 in June. Fangio and Munchak grew up about 10 miles from each other in neighboring Northeastern Pennsylvania towns. With Munchak’s expiring contract, Elway got the idea of hiring both finalists. Fangio was his choice for head coach, Munchak was his offensive line coach. Say what you want about Elway’s performance as GM – his five division titles and two Super Bowl appearances through his first five years followed by no playoff appearances in his last three seasons – he interviewed the right people. Three of his five got head coaching positions – Fangio, Taylor with the Bengals and Flores with the Dolphins – while Pagano got back in as the Bears’ defensive coordinator after sitting out a season and Munchak became one of the league’s highest-paid blocking coaches. Is it true there is an NFL Rule that says with any list of coaching candidates there must be African American candidates? Dutch – There must be at least one minority candidate. It’s called the Rooney Rule. The interview of emerging head coach prospect Brian Flores, the New England Patriots’ de facto defensive coordinator, met the Rooney Rule requirements for the Broncos. His experience with a winning organization, his team-first philosophy and strong character impressed the Broncos’ brass, from what I was told. But in the end, Elway opted for more experience. The Broncos were not surprised Flores did get a head coaching gig with the Dolphins. Hey Mike, I’m looking for a silver lining. Scale of 1-10, what do you think Case Keenum’s chances are of starting week 1 next season. Steven – With 10 as the most likely, I’ll go 6. The Broncos may consider Nick Foles and/or Joe Flacco, but if they do pursue them, they won’t be the only team. My position is the Broncos can’t have a top 10 draft pick in back-to-back years and not take a quarterback – especially when they don’t have a young quarterback on their roster. There are four, first-round quarterbacks in the 2019 draft: Ohio State’s Dwayne Haskins, Missouri’s Drew Lock, Oklahoma’s Kyler Murray and Duke’s Daniel Jones. Not necessarily in that order. Although maybe. The Broncos must get one of those four, develop him behind Keenum for half a season, then throw the kid out there. That’s my plan A. Plan B would be Foles or Flacco and use the No. 10 pick on a cornerback. Problem is, you have to form your free-agent plan before the draft. Either way, Good Lock.